Atheneum/Caitlyn Dlouhy Books, 9781481470261, 304pp. A boy who drifted into the seaside town of Isla as a baby searches for answers about where he and his parrot came from in this charmer of a tale laced with magical realism from New York Times bestselling author Alison McGhee. An exploration of family and how sometimes special bonds demand great sacrifices. Pablo washed up on the beach of Isla strapped to a baby pool 10 years ago, along with Birdy, a flightless parrot. Where he came from and how he ended up in the ocean with only Birdy to watch over him are mysteries—ones Pablo allows himself to think about only on the anniversary of that fateful day. Isla is a picturesque beachside town famous for its birds, including one whose existence has never been verified: the Seafaring Parrot, who, according to local legend, has seen all and remembers all. As the anniversary of Pablo’s arrival nears, a storm is predicted that will bring with it the “winds of change,” which spell fortune lost or fortune gained. The only one who may know about Pablo’s origins is Birdy. But unlike many of the birds on the island, Birdy doesn’t talk. That is, until the winds of change arrive. By the time the storm is over, Pablo will have felt a whirlwind of emotions and learned that feeling sad about what he has lost doesn’t take away from what he has achieved. VERDICT This understated book will appeal to readers who savor interpersonal relationships more than action-packed plots. Pablo was a baby when the “winds of change” guided him to the island of Isla, an inflatable swimming pool as his raft and a protective, curiously colored bird by his side. 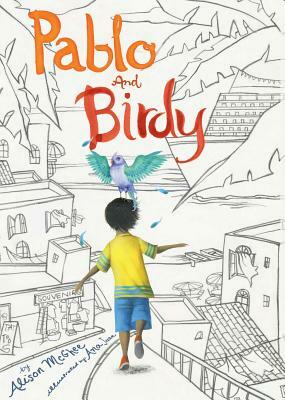 As Pablo’s 10th birthday approaches, his frustration over his lost history flares while Birdy remains flightless and silent. Then the winds of change and their promise of “fortune lost or fortune gained” return to Isla, this time bringing a pastry-thieving dog and a reporter seeking a mythical seafaring parrot, as well as strange behavior from Birdy. McGhee’s (Firefly Hollow) tender tale of the search for home, belonging, and identity smoothly incorporates elements of magical realism and powerful allusions to the refugee experience; for various reasons, most of Isla’s residents have chosen to make new lives there, something Pablo questions in hopes of better understanding his own past. Playful humor, often involving the Committee—a group of chatty, free-roaming birds that judges the fashion choices of passersby and stirs up trouble—deftly counterbalances the emotional weight of this moving tale.